a project by Fabbrica Europa; Festival Santarcangelo dei Teatri; Giardino Chiuso / Teatro dei Leggieri, San Gimignano; Officina Giovani – Cantieri Culturali ex Macelli, Prato; Assessorato alla Cultura e alle Politiche Giovanili del Comune di Prato. Verso la luce is the second part of a larger project that began with Senza uscita. It is the story of someone coming back to life and so of salvation, taking place in the rediscovery of internal light and life-force. 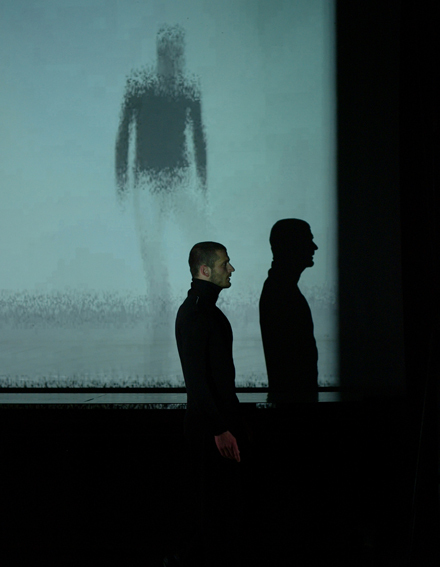 Leonardo Diana, accompanied by three musicians (Andrea Ferraris, Luca Serrapiglio and Andrea Serrapiglio who play live original music composed for the production), personifies the drama of a body emptied of its humanity by the continual struggle to remain in the ‘right’ position. That is, the position that will help it to move in society. The exit road from the obscurity of self-destruction is found in the gradual rediscovery of the shining body, in movement and the play of delays between human and light. The game is only interrupted when the body becomes aware of itself as the energy source. Certain of the path that leads ‘towards the light’, the body discovers that it no longer needs to interact with space and time because it itself is space, time and light.